Former Texas A&M University-Commerce quarterback Luis Perez has signed a one-year contract with the Philadelphia Eagles. Perez led A&M Commerce to a National Championship in 2017 and was named 2017 Division II Player of the Year. 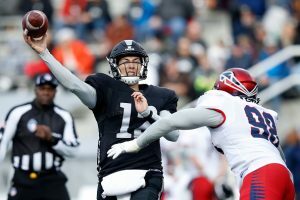 Perez most recently played with the Alliance of American Football’s Birmingham Iron. Perez led the Iron to a 5-3 record before the league folded. Young Eagles Flight Rally Scheduled for April 27th. Free Airplane Rides for Kids between 8 and 17 Years Old.